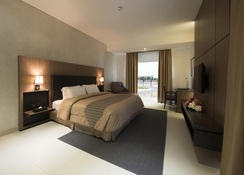 If you’re in need of all-inclusive accommodation in Umm Al Quwain, Pearl Beach Hotel is an ideal destination with a private beach.Are you looking for an eminent hotel that is well-equipped and offers 24/7 room service? Pearl Beach Hotel is a great destination to look forward in Umm Al Quwain. It offers deluxe rooms with ultra-comfortable beds, funky sports bar with tons of sports facilities, chic poolside bar, 24/7 café shop, fitness centre, swimming pool, fabulous restaurant, but above all proximity to the beach. It offers all-inclusive accommodations and facilities to families, couples, and young adults looking to experience authentic Middle Eastern hospitalities and services. Rooms in Pearl Beach Hotel are divided into: Deluxe One Bedroom Suites (king size bed & can accommodate 3 adults), Deluxe Studio Beach View (king size bed & can accommodate 2 adults), Deluxe Studio Garden View (twin-sized beds & can accommodate 2 adults), Superior One Bedroom Suites (king size bed & can accommodate 5 people), Superior Studio Beach View (king size bed & can accommodates 2 adults) and Superior Studio Garden View (king size bed & can accommodate 2 adults). All the categories offer different views of the surrounding and come equipped with modern amenities. 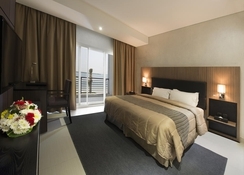 Some features common for all rooms are TV with satellite connection, air conditioning, safe deposit, en suite bathroom, shower, wooden furniture and balcony — the hotel offers 24/7 room service. Rooms are ultra-modern, spacious and adorn with handpicked furnishings. Oyster Bay is the main restaurant that serves Arabic, Continental and Oriental cuisines. All the items are carefully cooked by its well-appointed chefs using local and imported ingredients. Also to look forward are Fresh Sea-food Platter that are prepared using fresh catches and the Taste of India that offers authentic biryani, tandoori and other tasty Indian curries. It also houses a 24/7 café shop that serves hot and cold non-alcoholic beverages and a Pool Bar that serves both alcoholic and non-alcoholic drinks from sunrise to sunset. Sportmans Corner Lounge & Bar is the destination after sunset where music is high and flaming cocktails, mocktails and other international and local alcoholic drinks are serves. 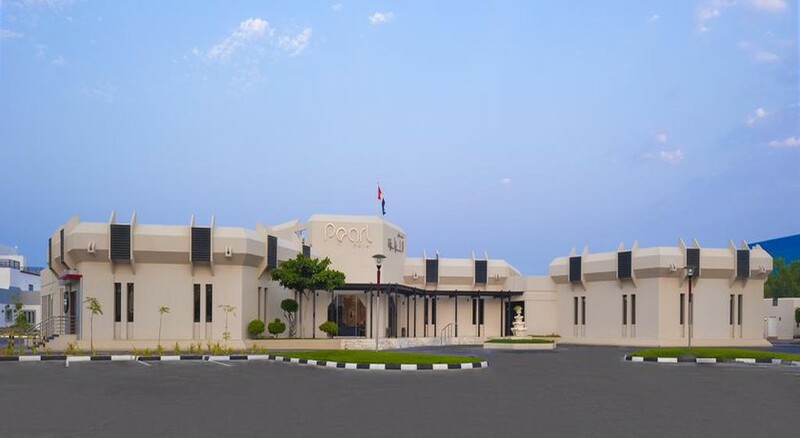 Located in Umm Al Quwain, in the Northern Emirates of the Arabian Gulf Coastline, Pearl Beach Hotel is just few minutes away from the city centre. This is a hotel that boasts of its own private beach located right in front of the hotel. And surrounded by a beautiful garden and large trees, the hotel offers a serene ambiance to travellers looking for a peaceful holiday. 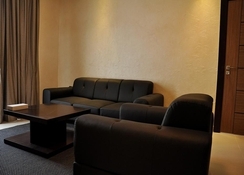 The hotel is 35 km from Sharjah International Airport and 60 km from Dubai International Airport. For water sports lovers, Umm Al Quwain is the destination for water skiing, kayaking, wind surfing, jet skiing, sailing, fishing and other activities. Place of interest would be Khor al Beidah (bird watching), UAQ Museum (7 km), 200 BCE excavation site and Dreamland Waterpark (23 km). Pearl Beach Hotel offers a recreation room that houses a wide range of indoor games such as table tennis, billiards, pool tables, foosball, darts and more. The fitness centre is not only equipped with a la mode machines, but imparts tons of fitness activities and programmes to guests who like to keep in shape. It has an outdoor pool surrounded with a sundeck furnished with sunbeds, umbrellas and recliners. For a little indulgence, there is a spa that offers sauna, steam room and beauty treatments, and for the children, there is a huge playground.